In addition to the cleanliness of community sanitation in everyday life, compressed garbage trucks have brought a new look to every community, street, and other places. We cannot treat garbage trucks as garbage trucks, but also maintain and maintain them. The service life will be longer, and the garbage truck will serve the public longer. Our sales manager will tell each customer about the maintenance and maintenance of the garbage truck from each sales vehicle. Will be used longer, I learned here from our sales manager, how to maintain and maintain the compact garbage truck. 1. Turn off the engine, remove the start key, and place the key in your own pocket. 2. Hang the sign with the words "repairing, do not start" on the steering wheel. 3. Use plugs to stabilize the front and rear wheels of the garbage truck so that the garbage truck can not be fixed. 4. Separate the power take-off device, close the cab acceleration switch, and place the control valve handle in the neutral position. 6. Check the safety and operation instructions of the various parts of the sticker, the defect and illegible adhesive tape should be promptly replaced. Ordering stickers can contact Zhengzhou Yutong Heavy Industry Co., Ltd.'s Environmental Service Department. 7. Check all lights and warning devices, including reversing alarm and filling device to open the warning horn, and find the fault in time. 8. Check the tank fluid level and check the oil leakage in the hydraulic line. The lower ball valve switch of the tank should be in the open position during inspection. 9. Remove trash left, right, both sides, and around the cylinder. 10. Check fasteners, cylinder pins, cotter pins and other fasteners attached between the carriage body and the chassis, fasten them in time, and replace them if necessary. Replace them with spare parts of the same specification and class. 11. Lubricate the squeegee assembly daily to lubricate the upper and lower sides of the slider slider to reduce wear. Before lubrication, place the slide in the upper position to facilitate lubrication. 12. Inspect each cylinder support for cracks caused by metal fatigue and repair or replace it promptly after discovery. 13. Check whether the operation buttons of the shovel, slide and scraper are normal and sensitive. 14. The routine maintenance of the chassis is carried out according to the chassis manufacturer's driver's manual. 1. Filler hinge pins are greased. 2 The scraper rotates the pivot sleeve with grease. 3. Scraper cylinder support is filled with grease. 4. Push the slider and apply the grease on the groove surface (car body stringer steel) or chassis oil. 5. All connection points and friction parts without grease lubrication are lubricated with chassis oil. 6. All cylinder pins are lubricated with chassis oil. 7. The rear frame filler arm is lubricated with a high-quality grease or chassis oil. 8. Chassis lubrication is performed according to the chassis manufacturer's maintenance manual. 1. Check the connectors, wires, and retainers of all circuits and tighten the connectors. Replace damaged mounts and worn wires. 2. Check all fasteners for wear and looseness. 3. Inspect hydraulic hoses and hard tubes for damage and wear and replace if necessary. 4. Check the connection between the longitudinal beams of the carriage and the upper and lower connecting blocks of the chassis of the car, and tighten the loose bolts in time to replace the damaged fasteners in time. The so-called maintenance is not to rub the surface of the garbage truck with water every day, but to maintain each part of the garbage truck, whether it is in working condition or not, so that the garbage truck should be in the best condition. ! 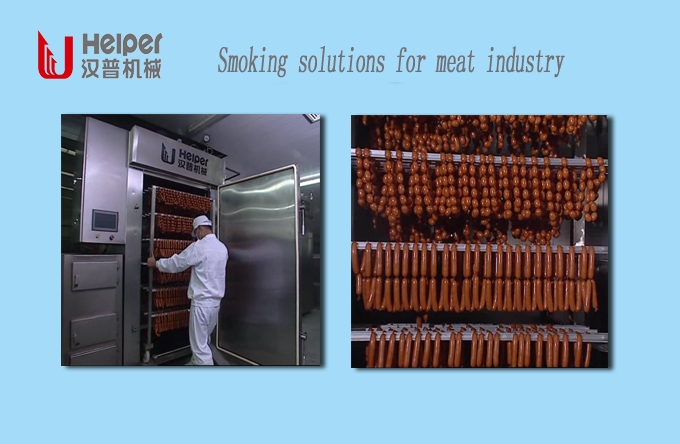 Helper have accumulated rich experience in the smoking(Smoking Chamber),dry maturing(Dry Maturing Chamber) and cooking(Cooking Chamber) solutions through decades of years development. We know clearly the importance of the temperature, humidity and ventilation conrtrolling for sausage production, thus our machine can hold control all the key points and help our clients to avoid the risk of defective products. Not only the machine itself, we are always pleasure to give our suggestions on the auxiliary and some other supported devices and equipment.